Caregiver Role Strain: Difficulty in performing family caregiver role. A caregiver is someone who gives support and helps another person in need, such as an ailing spouse or partner, a helpless child, or an aging relative. Yet, family members who are actively caring for an older adult usually don’t self-identify as a “caregiver.” Delicately understanding this role can help caregivers receive the support they need. 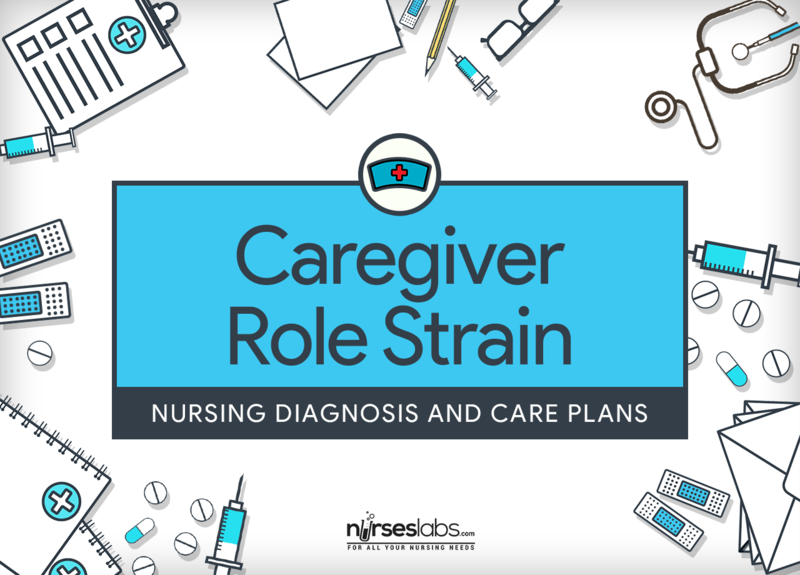 Caregiver role strain is an important diagnosis that has been well-described and studied from many aspects. The core of this care plan is on the supportive care provided by the family members, significant others, or caregivers accountable for meeting the physical/emotional needs of the patient. With short access to health care for many people, most diseases are diagnosed and managed in the outpatient setting; and more caregiving is being provided by people who aren’t health care professionals. Caregivers play a significant role in health. While caregiving can be rewarding and positive, many family caregivers experience significant physical, psychological, and financial stressors in association with their caregiving role. With this, they can be recognized as “secondary patients” who are at high risk for injury and adverse events. Nurses can aid caregivers by giving the requisite education and skill training, and offer support and guidance in every activity that promote their own health. Caregiver shows competence and confidence in performing the caregiver role by meeting care recipient’s physical and psychosocial needs. Caregiver displays satisfaction with caregiver role. caregiver exhibits flexibility in dealing with problem behavior of care recipient. Caregiver reports that formal and informal support systems are satisfactory and effective. Ascertain the caregiver’s knowledge and ability to implement patient care, including bathing, skin care, safety, nutrition, medications, and ambulation. Information provides a starting point for educational sessions. Fundamental guidance may reduce caregiver’s strain and enhance the relationship. Assess the caregiver–care recipient relationship. Mutually satisfying relationships promotes therapeutic caregiving experience. Dysfunctional relationships can result in ineffective, fragmented care or even lead to neglect or abuse. Evaluate the family communication pattern. Open dialogue in the family builds a positive environment, whereas concealing feelings creates problems for caregiver and care recipient. Assess the family resources and support systems. Family and social support are associated positively to coping effectiveness. Some cultures are more accepting of this responsibility. However, factors such as blended family units, aging parents, geographical distances between family members, and limited financial resources may hinder coping effectiveness. Evaluate the caregiver’s physical and mental health status that can affect caregiving. Even if fully driven to fulfill the role of caregiver, the person may have physical impairments (e.g., vision problems, musculoskeletal weakness, limited upper body strength) or cognitive impairments that influence the quality of the caregiving activities. Assess for neglect and abuse of the care recipient. Safe and appropriate care are priority nursing concerns. The nurse must remain a patient advocate to prevent injury to the care recipient and strain on the caregiver. Evaluate the caregiver’s appraisal of the caregiving situation, the level of understanding, and willingness to assume caregiver role. Caregivers must have a realistic perspective of the situation and the scope of responsibility. Individual responses to caregiving situations are mediated by an appraisal of the personal meaning of the situation. For some, caregiving is viewed as “a duty”; for others, it may be an act of love. Encourage the involvement of other family members to relieve pressure on the primary caregiver. Caring for a family member can be mutually rewarding and satisfying family experience. However, a typical family sizes become smaller because of postponing having children until later in life, future generations will have fewer nuclear family members to provide assistance. Tell the caregiver to set aside time for self. Aid the caregiver in identifying those that bring them peace and relaxation. Caregivers need may need reminders to attend to own physical and emotional needs. This helps conserve physical and emotional energy. Introduce stress-reducing methods to the caregiver. It is important that the caregiver has the opportunity to relax and reenergize emotionally throughout the day to assume care responsibilities. Allow caregiver to participate in in support group. Groups that come together for mutual support can be advantageous in providing education and anticipatory guidance. Allot time for the caregiver to discuss problems, concerns, and feelings. Ask the caregiver how he or she is managing. Nurses are in an excellent position to give emotional support and provide guidance throughout this challenging situation. Encourage the caregiver to know available family and friends who can assist with caregiving. Successful caregiving should not be the sole responsibility of one person. Recommend the use of available community resources such as respite, home health care, adult day care, geriatric care, housekeeping services, home health aides, Meals On Wheels, companion services, and others, as appropriate. Resources grant opportunity for multiple competent providers and services on a temporary basis or for a more extended period. Provide safe and effective alternatives to medication. This is necessary when the use of medication is inappropriate due to side effects, the risk of drug interactions, or a lack of evidence of their effectiveness in treating the problem. Allow the care recipient to show gratitude for care given. Feeling appreciated decreases feelings of strain. Acknowledge to the caregiver his or her role and its value. Caregivers have identified how valuable it is to feel appreciated for their efforts. Demonstrate necessary caregiving skills. Increased knowledge and skills increase the caregiver’s confidence and decrease strain. Give information on the disease process and management approach. Specific information improves understanding of the care recipient’s condition and behavior. Introduce the caregiver to a social worker for referral for community resources/financial aid, if necessary. Grants or special funds can sometimes be used to assist with physical needs. Increase family caregivers’ knowledge of effective and safe caregiving strategies and improve their emotional coping skills. This is necessary in order to reduce or prevent stress-related problems and enhance their quality of life.